There's something about the beauty products that are hard to find but worth the effort. Naturally living in Sephora and Boots-less New Zealand this can be the case a lot of the time but it definitely does make the find all the more satisfying. Here's a few of the harder to find gems that I've added to the stash recently.. Benefit World Famous Neutrals Palette in Most Easiest Nudes Ever *Someone bought this back for me from Australia. Firstly this palette wins for its gorgeous design and packaging. It is compact, lightweight and resembles a vintage book. Each of these kits contain six eyeshadows, two creaseless creams and four longwear powder shadows. In Most Easiest Nudes Ever you'll find the cream shadows; rsvp and no pressure. These are both super creamy in formulation. When applied with a flat shadow blush they glide on like silk. The other four shades in this palette are; call my buff (pale gold with shimmer), thanks a latte (golden brown with shimmer), pinky swear (soft matte pink) and quick, look busy (matte espresso). I love the colours in the palette in particular the creaseless cream shadows as they are such gorgeous colours by themselves and they last really well. This would be a great palette for eyeshadow beginners or anyone on the go who wants to create simple but effective eye looks. Origins Plantscription Concealer in #2 My old concealer was becoming cakey and wasn't really the right colour for me so it was time to search for a new one. I saw this on Alix's blog and made a mental note to keep an eye out for it next time I went to Mecca. This anti-aging concealer is formulated with Anogeissus which helps to cover dark circles and minimise the appearance of fine lines, wrinkles and flaws. This shade is the perfect match for me. It blends extremely well, you aren't left with visible concealer patches and it lasts well too. I'm quite tempted to have a look at the matching foundation as well. Nars Pro-Prime Smudge Proof Eyeshadow Base The cult classic, holy grail product, loved by eyeshadow worshippers and oily lidded gals alike. This primer dries clear on the lid and leaves the eye area smooth for shadow application. Obviously this primer works best with Nars eyeshadows but it holds other powders just as well. My eyeshadow lasts a lot longer when I'm wearing this, gone are the days of being asked if I'm even wearing any eyeshadow. I'm yet to test this with cream shadows but I will keep you posted! * Benefit Cosmetics will be available in New Zealand from next month. * Nars and Origins can be found at Mecca Cosmetica or online here. How exciting that Benefit will be available in NZ so soon! 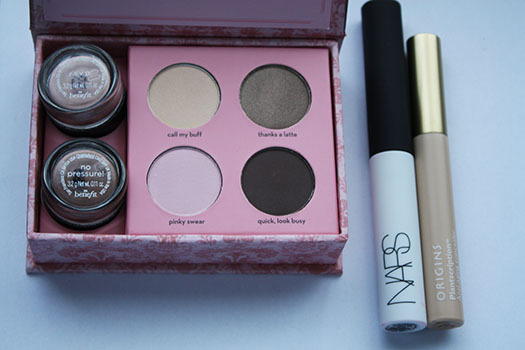 I am dying for one of their palettes or the Benetint, so pretty. So so exciting!! I can't wait for it to finally be in New Zealand. You should get one of their palettes Maria, so good :). I think this one or Most Glamorous Nudes would be perfect for you. Ooh would be interesting to hear how the Nars eyeshadow primer worked out with cream eyeshadows? It works really well with cream eyeshadows. Eyeshadows seem to crease on my lids quite easily and with this underneath those shadows either don't budge or don't crease for ages if they do.